It’s been a while since The Man Bird and I last visited The Kedleston Country House Hotel (KCHH), and there has been more than few changes! Not only is there a lovely new manager called Stephanie, but there is an entirely new team of staff in place (including a new wedding co-ordinator). We were invited along to try the Fish and Fizz Friday concept, and seeing as I’m a huge fan of fish anyway it worked out perfectly. There isn’t a separate menu for this Friday special, so if there’s a group of you dining together you can all choose from the same one. The only difference is that if you choose a fish dish you get a complimentary glass of fizz - nice! Having arrived a little early for our table, His Nibs and I decided to kick back and relax at the bar with a glass of Malbec and a pint of Moretti. I was sorely tempted to have a cheeky Gin and Tonic; if you’re a fan of this tipple, you need to pay KCHH a visit - they have a seriously good selection of Gins! A lovely young man took our drinks through to the dining room for us and showed us to our table. There had been a few pitter-patter raindrops falling (not on my head, luckily!) earlier, but it hadn’t really done much to lower the temperature or humidity of the summer evening. Thankfully Stephanie had had the foresight to open all the doors and windows as wide as possible, and the slightest of breezes ran through the room every now and then. For starters we chose the Soup of the Day (Leek and Potato on this occasion, for The Man), and Heritage Tomato Salad with chilled Tomato Gazpachio, Basil oil, Garden herbs, and Goats Cheese for me. A jug of chilled iced water with Lemon slices in was brought over to our table and the first glass was carefully poured for us; a nice touch I thought. Soon after an amuse bouche platter of chilled Tomato Gazpachio and herb bread with Balsamic vinegar and Olive oil was brought out for us to nibble on. The chilled Gazpachio was just the ticket to cool down with in the heat and it was bursting with flavour. I loved the fact that the Balsamic was nice and treacly in consistency; it stuck nicely to the bottom of the bread and let the oil sit on the rest so that you got both tastes in the mouth. When our starters were brought out the young man saw my Malbec and asked whether I would like my fizz then, or at a later time in the meal. Again, a nice touch I thought. The Man Bird loved his soup; it had a beautiful Leek taste to it. Now, I know that sounds obvious (seeing as it was Leek and Potato soup! ), but you’d be surprised at how often this flavour is sorely lacking. 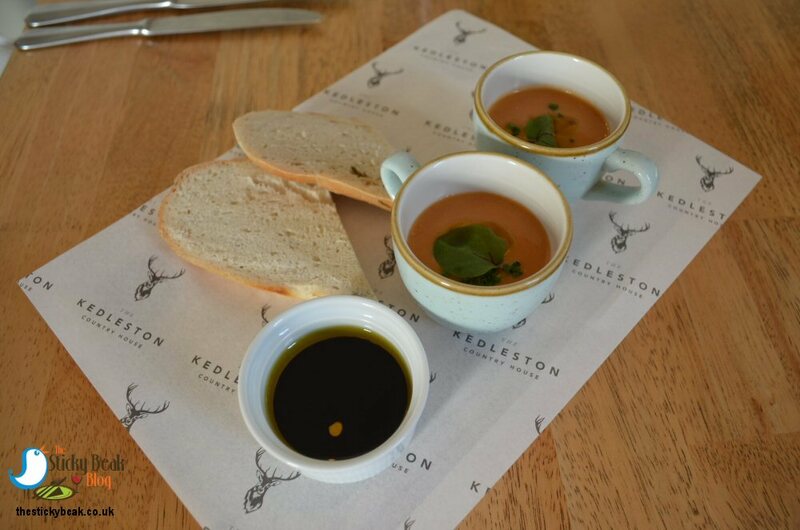 Kedleston serve their soup completely smooth, which I think is as it should be unless you’re being served a Minestrone version, and it had a superb creaminess to it too. 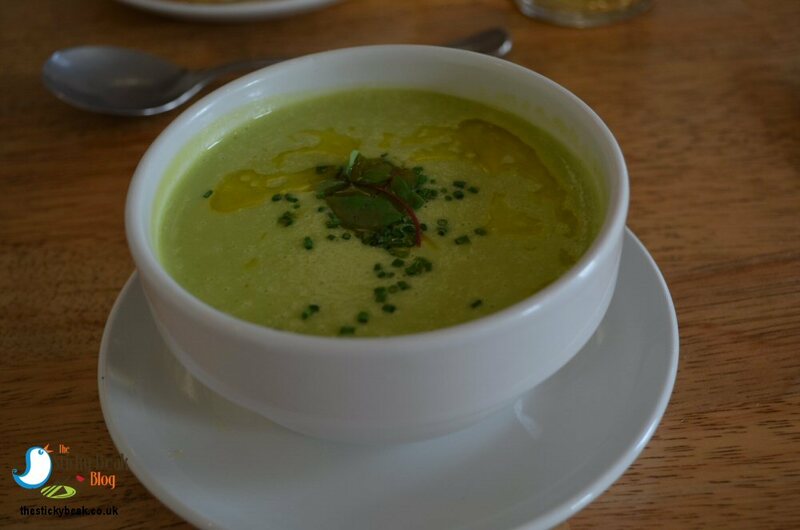 The “tails” of the Leek had also been included and imparted their gentle verdancy to the soup, as well as their flavour. A garnish of fresh Chives from the KCHH garden and a swirl of Olive oil completed the dish, and the Chives gave even more onion-esque notes to the soup. I had contemplated the Cured Trout with Pink Grapefruit, Orange, and Dill Mayo for my starter but because I was having Salmon for my main decided against it. As it turns out, I would’ve missed out on a simply magnificent Heritage Tomato salad starter, so I was rather glad I’d changed my mind. There was a wonderful assortment of colours on my plate: yellow, red, green and purple. All the Tomatoes had been cut differently into slices, wedges, and halves before being placed artfully around the plate to show off their colour and texture. The concentrated taste of the sun’s energy came bouncing through on the palate as I bit into the vegetables flesh, and each one was slightly different in intensity and texture. Swirls of Basil oil and Gazpachio added their fruitiness to the mix too, another light fresh taste on the tongue. 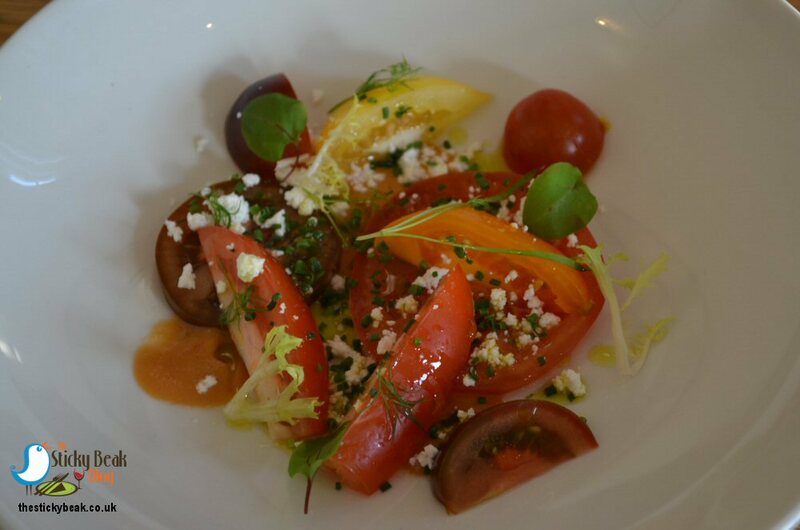 The final element to this vibrant starter was crumbs of young, salty Goats Cheese; it seemed to enhance the sweetness of the Tomatoes with its light tang. Our server was pleased to hear that we’d thoroughly enjoyed our starters, and was even more pleased when two empty plates were being taken back to the kitchen. 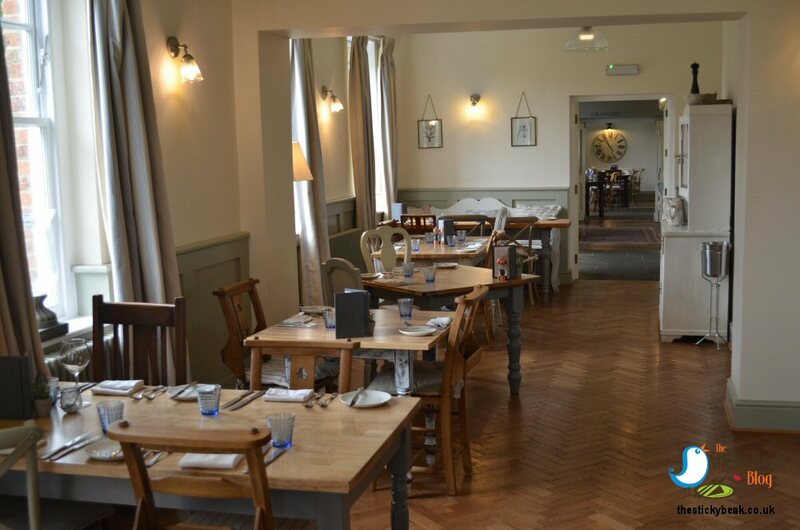 By now, the restaurant was livening up nicely with other groups having been seated at their tables, and a gentle thrum of laughter and conversation was rippling through the room. His Nibs had the Pan fried Rib Eye Steak with classic garnish of flat field mushroom, grilled Tomato and chunky homemade Chips, and I had the Roasted fillet of Salmon with New Potatoes and warm Cockle and Green Bean dressing. One thing that always deceives us at Kedleston Country House Hotel is the portion size; the meals are served in huge platters so they look more modestly sized than they actually are. Consequently, you start off thinking that your appetite might not be wholly satiated after the second course; halfway through though, your waistband starts to protest somewhat at your expanding girth! The Man Bird was presented with a whopping piece of Beef, and it smelled mouth-wateringly good I must say. It yielded nicely to light pressure from the steak knife and was melt-in-the-mouth tender, much to the delight of His Nibs. A full rich taste bopped about in the mouth, and Chef had gently seasoned the meat as he cooked it, so the real taste of the beef came through. The Boy Wonder had requested it be cooked medium, and that is exactly what he got; a small pink centre and no oozing of blood on the plate. A pair of large field Mushrooms had been gently cooked in herb butter, so they were attractively glossy on the plate and had their natural earthiness tempered with lighter herb nuances. The whole Tomato had been roasted to make it soft and squishy in the centre, gently spreading out its flesh when cut into; it had a joyous fruitiness to its taste that epitomises summer. 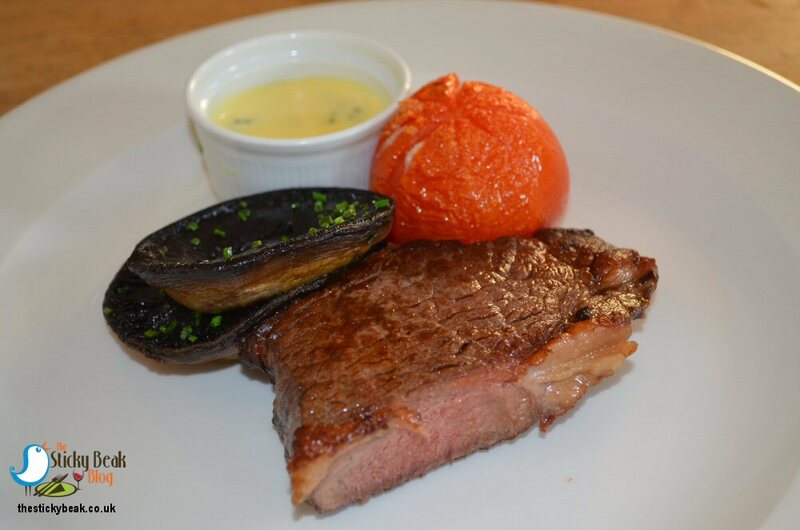 Nothing beats a good steak except good steak and chips; and that’s precisely what His Nibs got at Kedleston Country House Hotel. 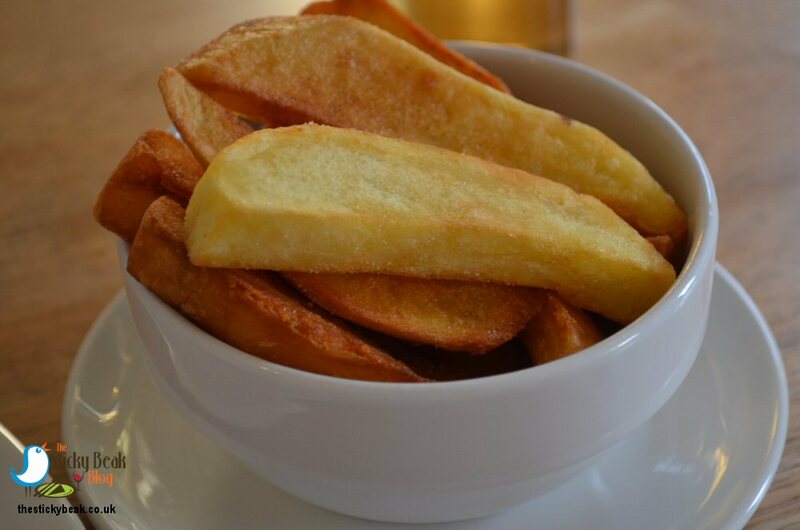 Fantastically crispy outers revealed soft, cushiony inners that had a nice sweet edge to them. My Salmon fillet was quite possibly the largest one I’ve ever had, it was a huuuuuge affair! Chef had crisped the skin brilliantly and the fish had been kept moist as it cooked - something that I really appreciated with each bite I took. 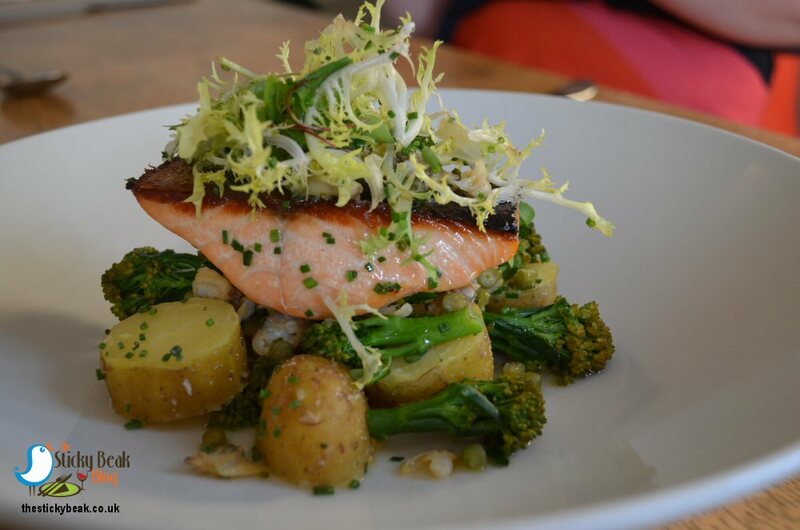 To accompany the sweet, succulent fish were just-firm New Potatoes with their soft nutty flavour, and spears of al dente Tenderstem Broccoli. Meaty textured Cockles and finely sliced Green Beans in cooking liquor made the perfect dressing for this meal; they had a mild flavour that didn’t drown the Salmon out. A crisp selection of lightly dressed Frisee and other textural leaves completed my delicious meal. At this juncture I asked for my fizz, and what a beauty it was; gorgeously light and fruity in the mouth. Perfect for both fish and summer! For pudding The Man had Lemon Posset with Curd, Blueberries, and Meringue; I fancied the Warm Chocolate Fondant with White Chocolate and Rum, and Raspberry Sorbet, although it had been a close call with the Duo of Cheddar and Blue Cheese with Traditional Garnishes. 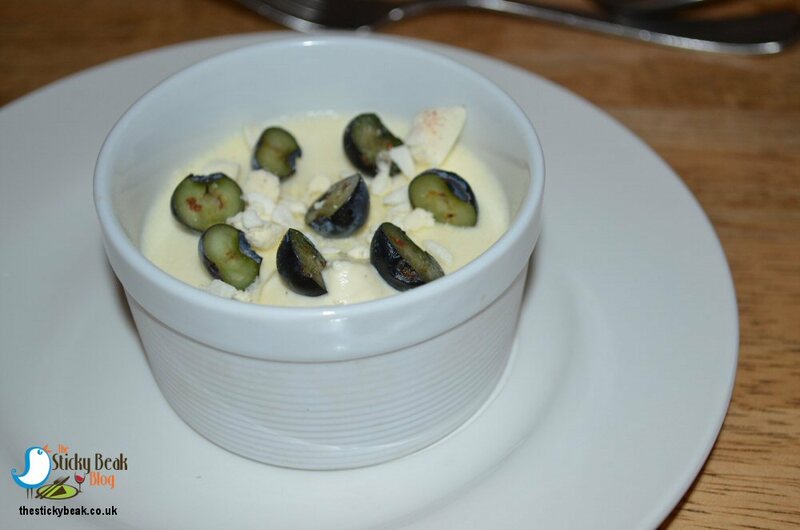 The Posset was velvety and indulgent with a softly rounded Lemon note within it. What The Man Bird really liked was the fact that it hadn’t been overly sweetened so the summery Citrus notes caress could really be appreciated by the palate. Juicy Blueberries had been carefully halved and placed strategically around the dish so that their colour could catch the eye, and nestled among them were pieces of crushed Meringue that added a zap of texture and sweetness as they were crunched into. 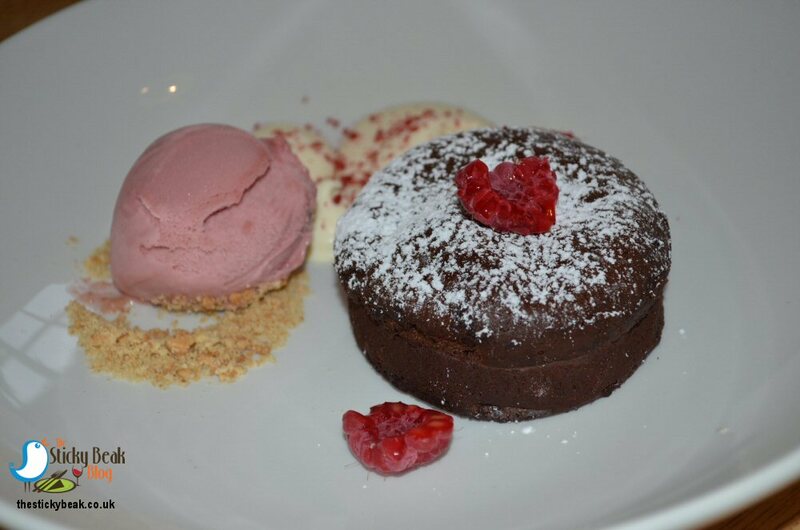 It isn’t often that I have a Chocolate Fondant, but I do have a soft spot for them if I’m honest. At KCHH the fondant is a wickedly indulgent dark version that satisfies even the most ardent craving for Cocoa. A light crust revealed first a gooey underside, then a decadently rich liquid core – pure naughtiness! To the side of this dark devil of temptation was a deceptively virtuous looking trio of white chocolate puddles; when tasted the Rum warmth quickly made its presence known to the mouth. Innocent it most certainly wasn’t! The Raspberry sorbet was wonderfully tart and partnered the rich fondant brilliantly; a fruity Allegro to the Cocoa Adagio in musical terms. The contrast was harmonious rather than jarring, and it brought my meal to a pleasurable conclusion. Throughout our evening, several members of the team enquired if our meals were enjoyable and to check if our drinks needed refreshing. Nothing was too much trouble for them; indeed they had been checking dish specifications for diners on the other tables, and fetching extra drinks as required. Cutlery was produced as necessary for steaks, or for desserts, and surplus items removed from the tables efficiently. Two black coffees ended our meal, and what a delicious meal it had been! 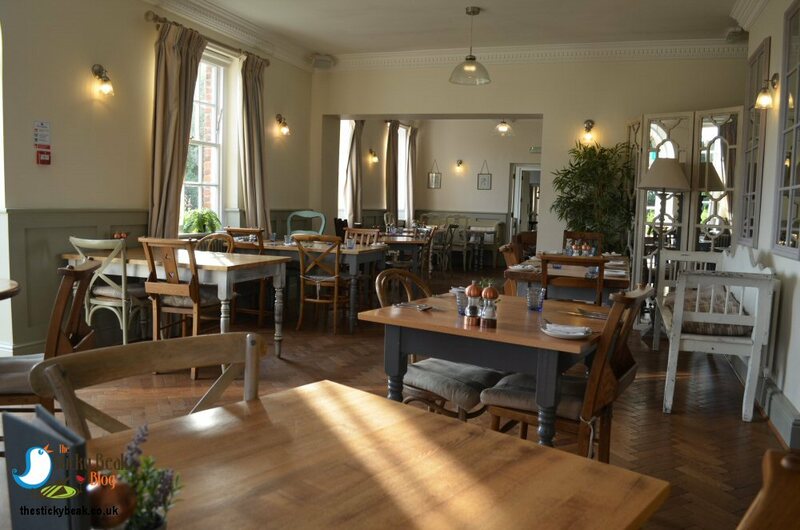 As well as “Fish and Fizz Fridays”, the Kedleston Country House Hotel offers lunchtime deals Wednesday-Saturday of two courses for £14.95, or three courses for £19.95. As you know dear reader, we have been reviewing lots of venues ahead of National Afternoon Tea Week which commences Monday 13th August 2018; KCHH are also celebrating this quintessentially English pastime by offering free fizz with all their Afternoon Teas taken Wednesday 15th – Friday 17th August 2018. It’s also worth keeping a beady eye on their website as Kedleston Country House Hotel have a whole host of events coming up. On September 15th there will be a Wedding Open Day; the venue will be dressed up as if for a wedding, so prospective brides and their families can see how mesmerising it looks. Members of the dedicated wedding team will be on hand to answer questions, as will trusted suppliers that KCHH use for their special functions. The August Bank Holiday will see Stephanie and her team hosting a family fun day with Archery, Bouncy Castle, and a Glitter station all available to keep children amused. 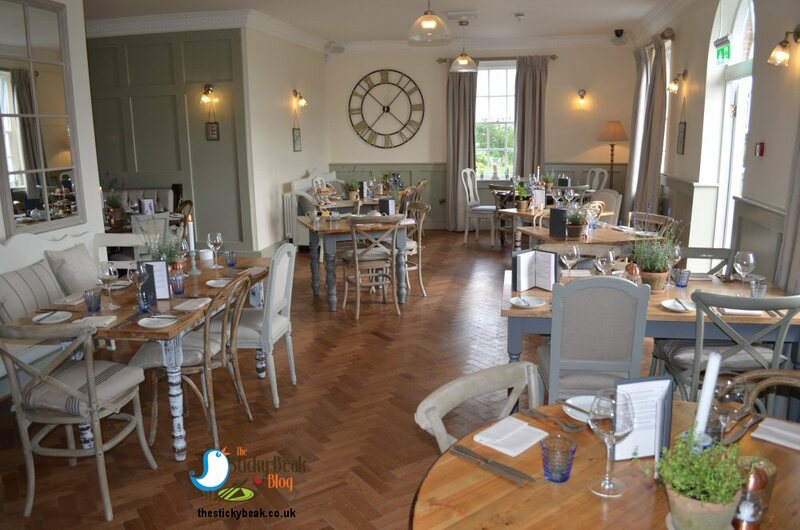 There will be a special Bank Holiday lunch menu served on that day, priced at £14.95 for two courses which includes free entry to the fun day event. The venue hosts murder mystery events throughout the year in conjunction with Murder On the Side; we attended one last year and it was a complete blast!! There are several new themes this year, all of which will no doubt be as entertaining as the one we took part in. Friday 26th October is the next planned one, and there is a pre-Christmas one on Saturday 15th December. A comprehensive listing of Kedleston Country House Hotel’s festive events will be on their website in the next few weeks, so keep your eyes open for that too. Hot Wings awarded to Stephanie and her team; the food was lovely and we enjoyed the evening from start to finish.